Astronomer Jose Ramon Vales of the National Institute of Astrophysics, Optics and Electronics (INAOE) held a press conference to announce the near miss. Based on his observations the asteroid was believed to be a city-killer; i.e., a rock big enough to destroy a city if it had impacted. Luckily for the residents of Mexico the asteroid only briefly entered Earth’s atmosphere and was deflected. The interaction of the asteroid with the atmosphere is what caused the sonic booms and bright flash of light. Just six days ago another extremely bright fireball was reported over Maine in the U.S. Dash-cam video footage from a police car showed it lighting up the night sky as well. And astronaut Tim Peake recently shared an image of a 7-mm crack in a window on the International Space Station caused by space debris. Evidence suggests this uptick in fireballs 1000 years ago was not limited to pretty lights in the sky. Likely a few large meteors actually slammed into the ocean causing massive tsunamis on both sides of the Atlantic. According to the Anglo Saxon Chronicle, on September 28, 1014 AD, a tsunami devastated many towns in England. Researchers in North Carolina have noted that the coastal areas of the state were devastated around this time as well with massive waves completely wiping the Outer Banks off the map. Dallas Abbott of the Lamont Doherty Observatory at Columbia University found tsunami deposits from the same time period in New York, the Caribbean and northern South America. She also found sediment deposits from the mid-Atlantic ridge in an inland bog in New York that also dated to the same time period. Her research concluded that the only thing that could have produced all these effects was a meteor impact in the center of the Atlantic Ocean. Abbott noted that all these events corresponded with a large ammonium spike in the Greenland ice core record similar to other such spikes recorded around the time of known meteor impacts. Disturbingly, this is all in line with predictions made in my book Mayan Calendar Prophecies: Predictions for 2012-2052. 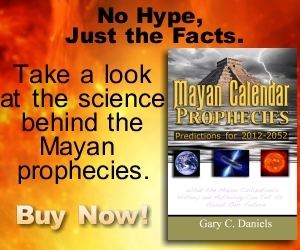 According to my book (published before the December 21, 2012 supposed end of the Mayan calendar,) the Maya did not predict any type of catastrophe for the actual end date. Instead, I argued, the Mayan calendar marked the end of a 5,000 year cycle between impact events. I argued that evidence exists in both the geologic and ice core records of a major impact event on Earth near the end of the previous Mayan calendar cycle. Thus the time period after the end date of the current Mayan calendar cycle was believed to be a similarly dangerous time. I argued that if my interpretations were correct we should see an increase in meteor activity after the Mayan calendar end-date. This is precisely what appears to be happening. Coincidentally, Dr. Mike Baillie, a climate scientist at the Queens College in Belfast, Ireland, found a correlation between the Mayan calendar and impact events as recorded in the ice core record. He noted that ammonium peaks in the ice core record, known signatures for impact events, occurred very near Mayan calendar endings on three separate occasions. He argued the Mayan calendar was designed to track these impact events. Thus two researchers working independently of one another came to the same conclusion: the Mayan calendar was designed to warn of future impact events. Is it any coincidence then that just a couple months after the “end” of the Mayan calendar a meteor exploded over Russia? It was, in fact, this event that woke the world up to the very real dangers of impact events. Before this event astronomers assured the world that impact events were rare things that only happened once every few million years. Those estimates are no longer taken seriously today. The near miss over Mexico last night of an asteroid capable of destroying a city should cause alarm in all the world’s governments especially since it came without warning. The fact that this recent uptick in fireball sightings is similar to one 1000 years ago that was also associated with several oceanic impacts that caused mega-tsunamis that devastated lives on both sides of the Atlantic should ring all kinds of warning bells for these governments.